You know why I'll never be a food blogger? Because, I will never make food during the day, when there's good lighting, just so I can take pics for this blog. I take pictures at night, in my badly lit kitchen, right before I eat. I forgot to take a picture of this until after I ate my first bite....oh well. 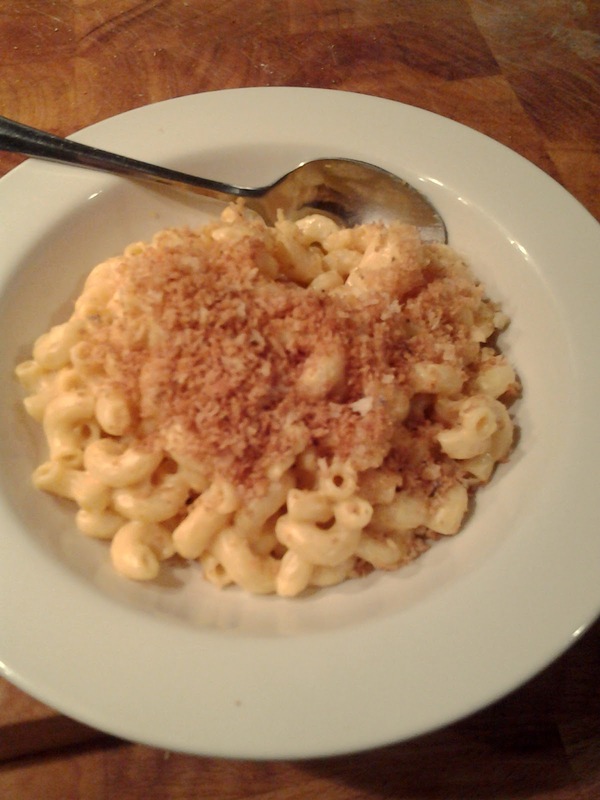 So vegan mac n'cheese. I think most people have a hard time with the idea of going vegan because of dairy. Everyone loves cheese, right? It's the reason I was a vegetarian, and not vegan for a long time. We'll talk about the plight of this poor dairy cows some other time. Today, I want to talk about this delicious, non-dairy cheesy, creamy mac n' cheese. One thing I've learned on my vegan adventure, is dairy is really unnecessary. This recipe sounds crazy, but somehow it makes this amazingly creamy mac n' cheese. Basically, you blend boiled potatoes, carrots and onions with nutritional yeast, cashews, water, garlic powder, coconut milk, lemon juice and a pinch of paprika. Somehow it magically turns into an amazing cheese sauce. Even if you don't want to go vegan, I would imagine a mac n' cheese with veggies and nuts is way healthier than dairy and cheese...just saying. Now, I had to double the recipe to have enough non-dairy cheese sauce to cover a whole box of elbow macaroni. My two like their mac n'cheese with a whole lot of sauce. I also quickly pan toasted some panko bread crumbs with coconut oil, which I think made this dish perfect for me. I would give you the recipe, but that seems wrong since the lovely Lindsay from Vegan Yumminess came up with this recipe herself. Plus, you should check out her site, because her pictures are way better than mine. So go check it out on her blog, you won't be disappointed!